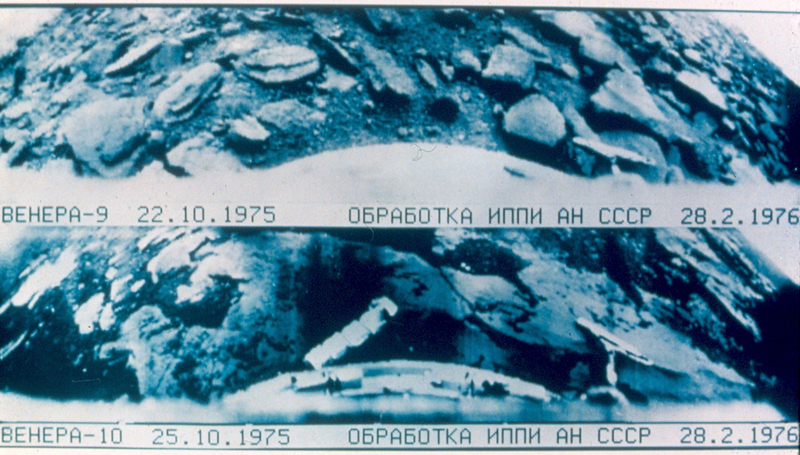 Venera color Most of what we know about atmosphere and detail of surface of Venus comes from Russian spacecraft. 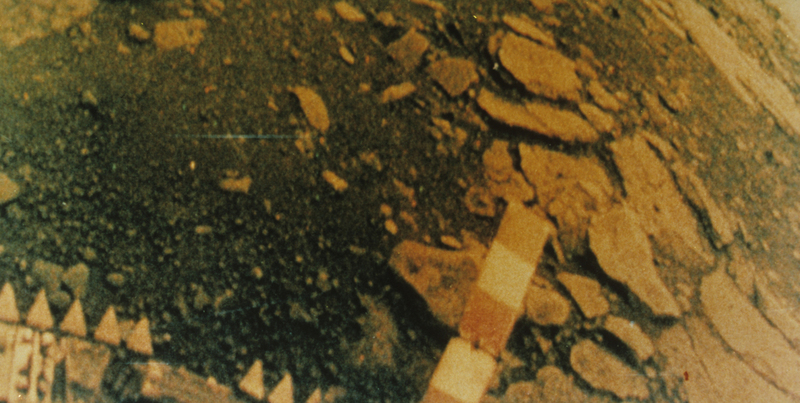 The Russians landed a number of spacecraft on Venus, floated instrumented balloons in the atmosphere. Temperature structure of terrestrial atmospheres All three atmospheres have tropospheres near surface, where temperature drops with altitude. 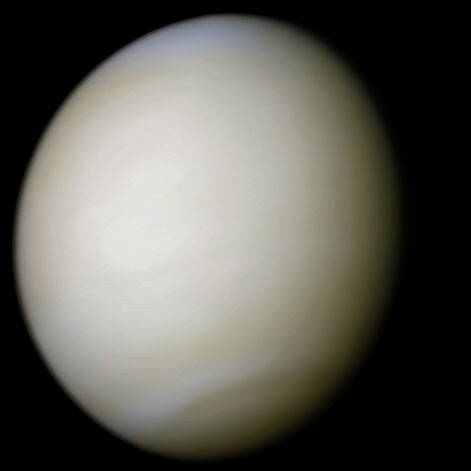 The troposphere of Venus is much more extensive than that of Earth- the temperature drops over 500K in the Venusian troposphere, vs. less than 100K drop for Earth. Venus in "real" color (visible wavelengths) Not much to see!! I have never seen any sort of variation on Venus looking through any telescope. Venus in ultraviolet In the UV, you can see some vague markings caused by variations in cloud properties. 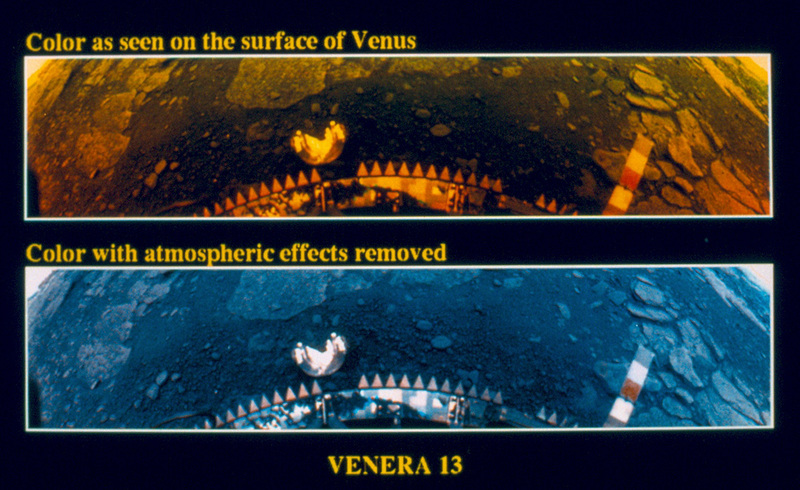 These markings are observed to move quickly, indicating high speed winds in the upper atmospehere of Venus. 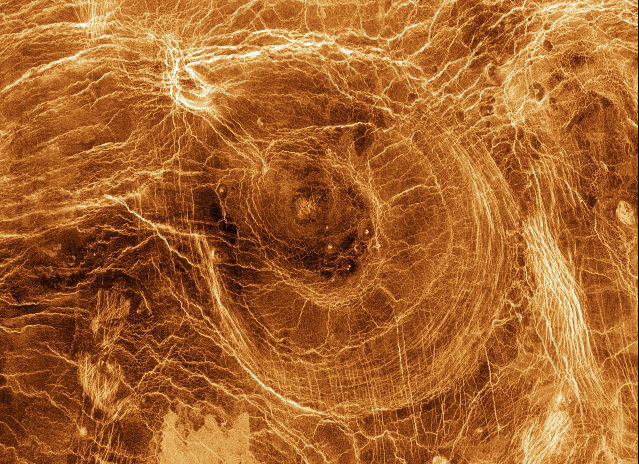 Venus global topography This shows "elevation" of Venus on a global scale. Note the two large "continents"- Aphrodite Terra (roughly size of Africa) and Ishtar Terra (roughly size of Australia). 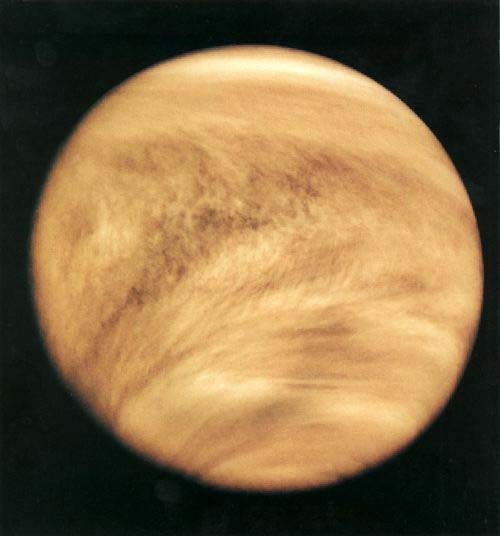 About 80% of surface of Venus is within a kilometer of the average altitude. 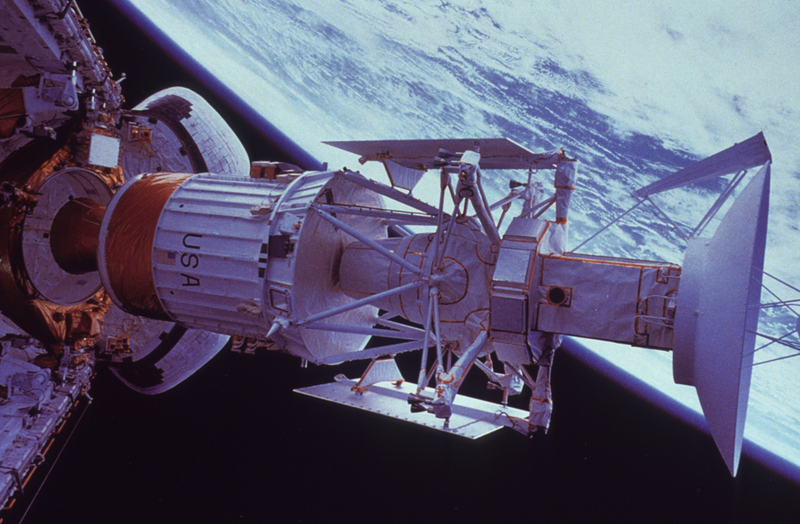 Magellan coming out of Shuttle bay The cylinder labeled "USA" is the rocket that will propel Magellan from Earth orbit to Venus orbit. 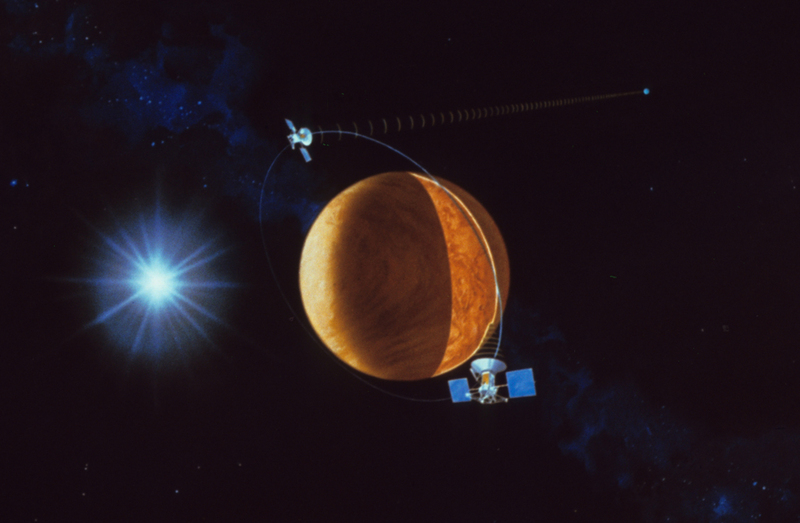 Magellan in orbit around Venus Almost everything we know about the large-scale surface features on Venus comes from the US Magellan mission. 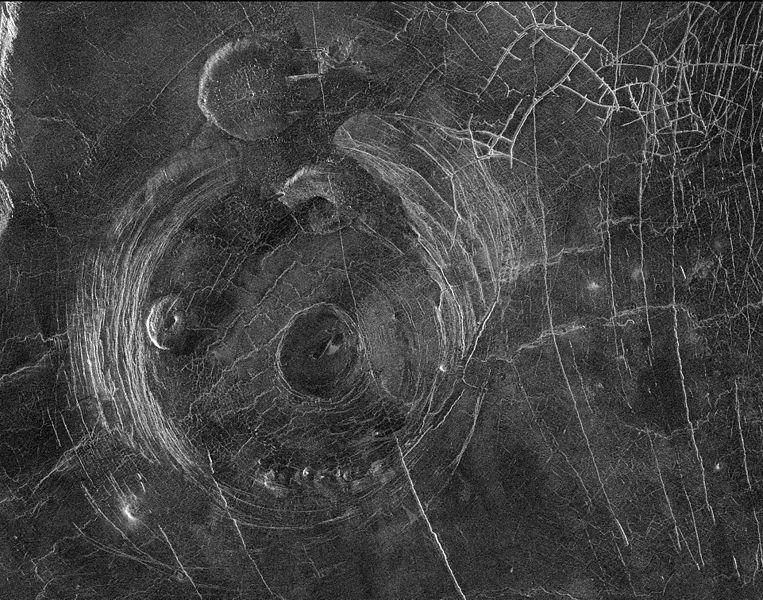 This spacecraft orbited Venus from about 1990 to 1994, and used synthetic aperture radar to make a map of almost the entire surface of Venus at about 60 meter resolution. 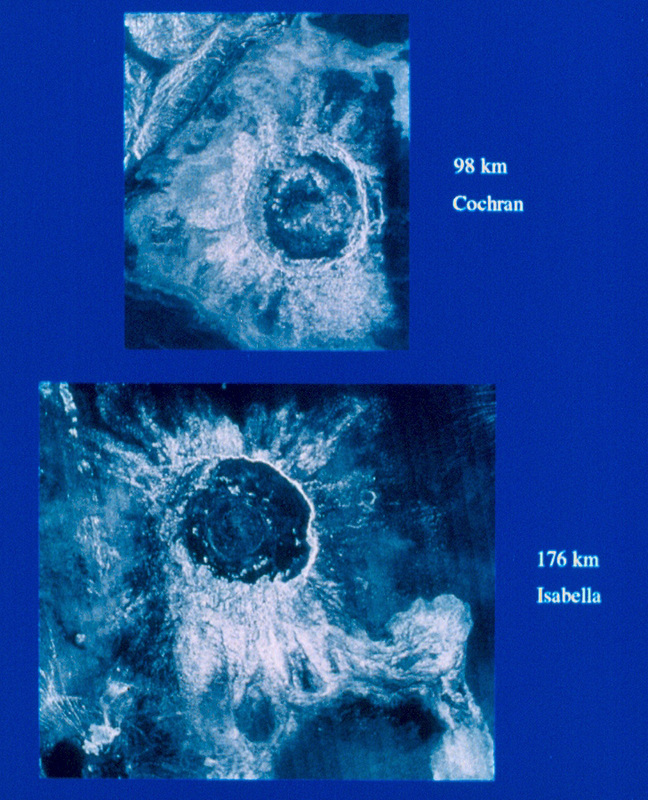 Three impact craters on Venus Magellan "image" of 3 impact craters. For scale, the rim of the one in the upper left (Danilova) is about 50 km in diameter. 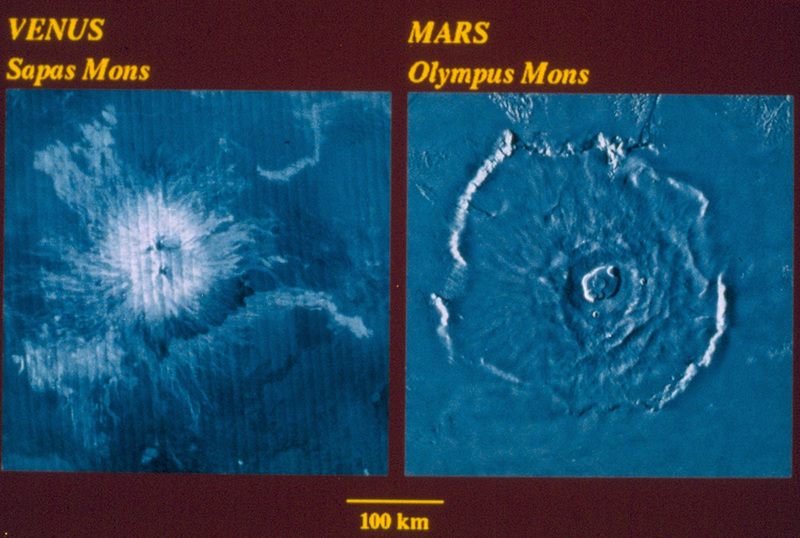 Large shield volcanos on Venus and Mars These large shield volcanoes are roughly analogous to the Big Island of Hawaii, but on a larger scale. Arachnoid An arachnoid is a large structure of unknown origin, found only on the surface of the planet Venus. Arachnoids get their name from their resemblance to spider webs. 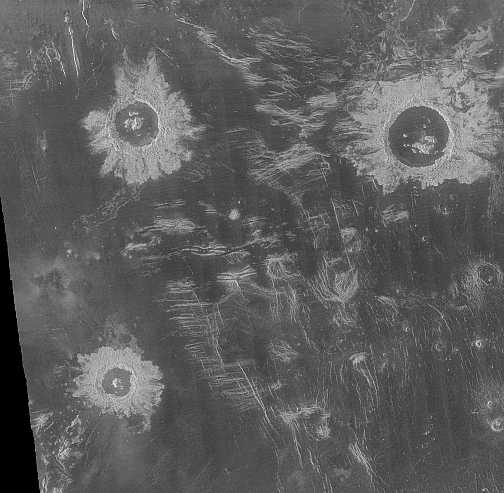 They appear as concentric ovals surrounded by a complex network of fractures, and can span 200 kilometers. Over thirty arachnoids have been identified on Venus, so far. The arachnoid might be a strange relative to the volcano, but possibly different arachnoids are formed by different processes. Pancake dome volcano A pancake dome is an unusual type of volcano found on the planet Venus. Pancake domes have a broad, flat profile similar to shield volcanos and are thought to form from one large, slow eruption of viscous silica-rich lava. 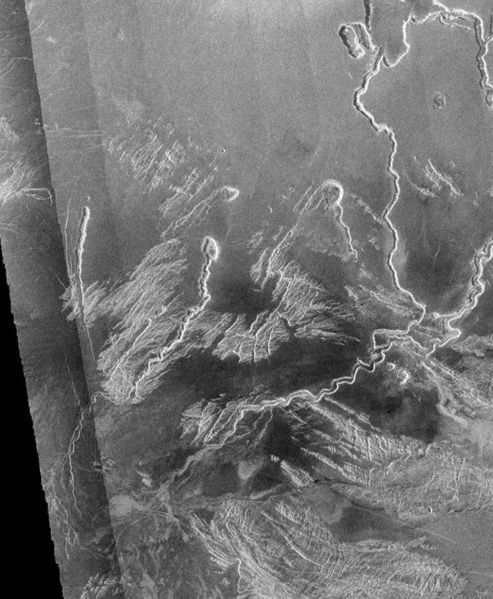 Fotla Corona On Venus, coronae are large (typically several hundred kilometres across), crown-like, volcanic features. It is believed that coronae are formed when plumes of rising hot material in the mantle push the crust upwards into a dome shape, which then collapses in the centre as the molten magma cools and leaks out at the sides, leaving a crown-like structure: the corona. Carbonatite lava carved channels? Hope the Venusians had titanium inner tubes to go tubing when these things were flowing!